In ZENworks Control Center, in the left pane, click Configuration. 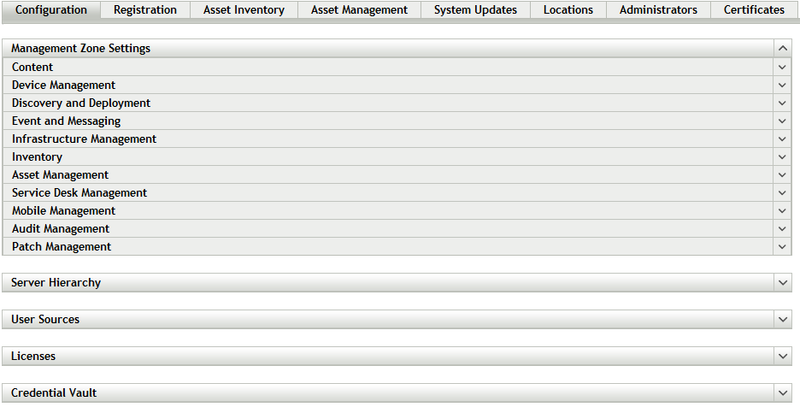 In the Administrators panel, click New > Administrator Group to display the Add New Administrator Group dialog box. 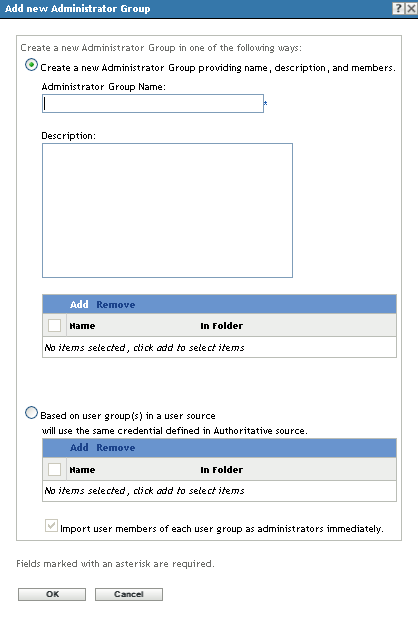 The Add New Administrator Group dialog box lets you create a new administrator group account by providing a group name and adding members to the group, or you can create a new administrator group based on an existing user group in the user source. Each administrator group name must be unique. Create a New Administrator Group by Providing a Name and Adding Members: Select this option if you want to create a new administrator group account by manually specifying the name and adding the members. To add members, click Add, then browse for and select the administrators you want.You can add any number of administrators to the group. You cannot add other administrator groups to the group. Based on User Groups in a User Source: Select this option if you want to create a new administrator group account based on user group information from your user source. To do so, click Add, then browse for and select the user group you want. NOTE:To ensure that all top-level groups and all the nested groups of the user container are imported, while creating the user source, you need to enable the Top level groups and all the nested groups option. For more information, see User Source Settings in the ZENworks 11 SP4 User Source and Authentication Reference. Import user members of each user group as administrators immediately: Select this option to enable the user members of the selected user groups to be immediately added as administrators who can only view the ZENworks Control Center pages. When you have finished filling in the fields, click OK to add the new administrator group to the Administrators panel. Assign rights directly to the administrator group. For instructions, see Section 6.0, Assigning Rights. Assign an administrator role to the administrator group. The group receives all rights assigned to the role. For information about creating and assigning roles, see Section 5.0, Managing Administrator Roles.